We all know how precious floor space is in Hong Kong, but things definitely get tight when you add a growing family to the mix! 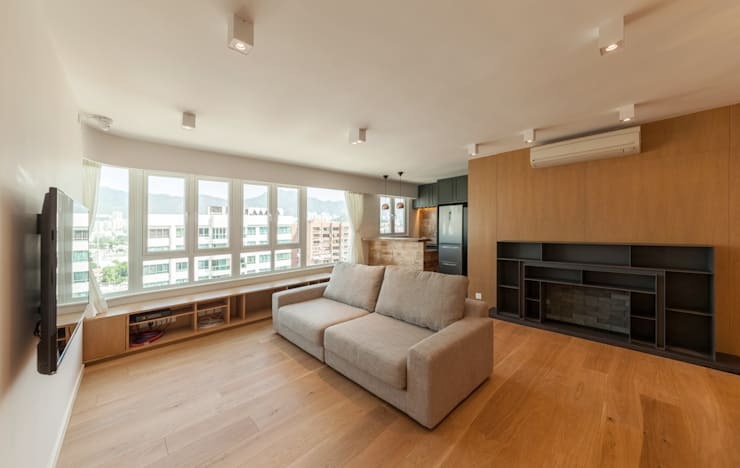 So we expect many of you will be interested in this Hong Kong apartment that was built for a family. 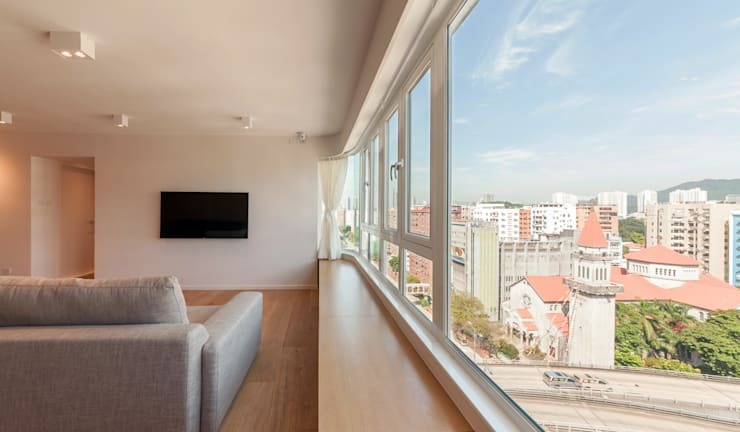 The apartment runs over 110 square metres. Although this may seem generous to some readers, and perhaps even meagre to others, the interior architects Arctitudesign were particularly conscious of using that space very wisely. The home has built-in cupboards and a bright, expansive decor. But what's more important is that all this was done without sacrificing any of the special quirks and customisations that make a house a home. Let's go on a photo tour to see more! The apartment has incredible city views. The designers have made the most of this feature by installing a deep-set window sill that runs along the entire length of the living room. This adds storage to the living room and creates a lovely place to sit as well. A window seat like this is a great way to make sure that one takes the time to really enjoy the advantage of a home like this. The living room has a spacious and very open feel. This has been achieved by using only the sparest of living room furniture and allowing the bright window views to remain dominant. A white living room this sparse in furnishings runs the risk of looking a little clinical. But the architects have avoided this by using broad wooden panels with a golden varnish on the floor. Note how the grey sofa is set in the middle of the room rather than backed up against the wall. This helps divide the living room from the kitchen and main walkway. It also makes the living room a little cosier. The unique kitchen has some unusual walls etched with old wooden insignias. 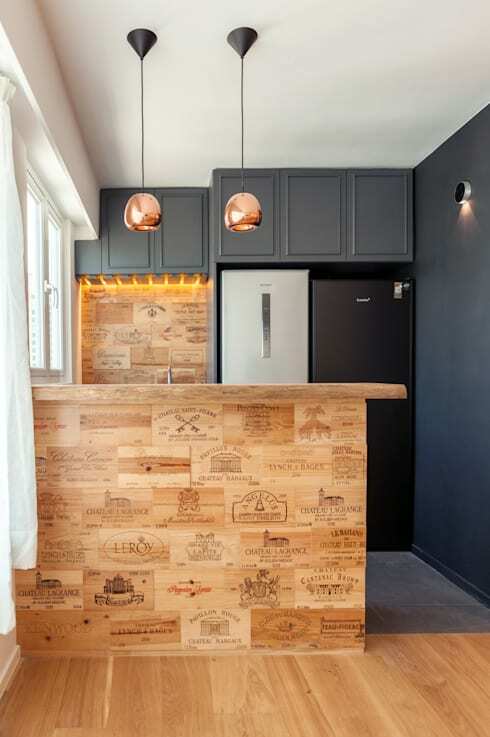 This kind of feature gives the home a little personality and is a nice way to integrate the owner's quirks and interests. The unusual nature of this feature however does not jar with the rest of the home. The classic antique grey kitchen cupboards remain dominant and the warm colour of the feature wall blends into the wooden floorboards and brass metallic pendant lights. This is a relatively small kitchen for a large family, so the designers have made good use of the space and installed some great storage cupboards on the upper wall. 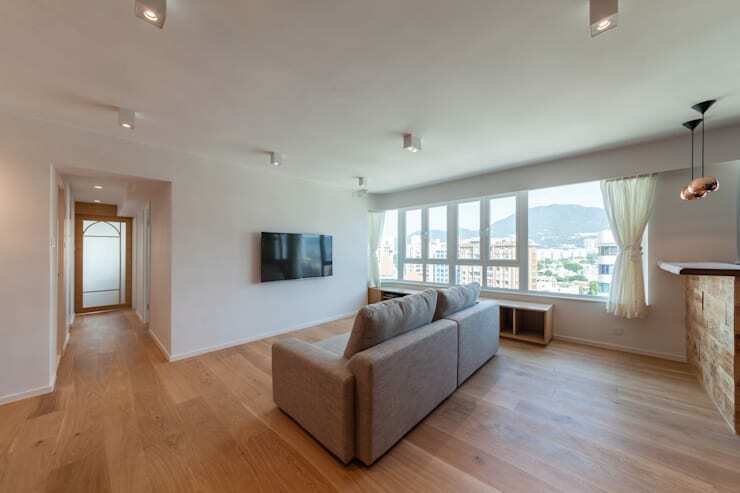 From this angle of the living room, we get a better look at all the built-in storage space. The deep window sill we looked at earlier has lots of open shelves and the fireplace feature has been very cleverly integrated with open storage units. The master bedroom is small, but perfectly realised. Bedside tables often clutter up a bedroom. But here, the side table has been integrated into the bedhead and wall cupboard. The mandatory beside lamp has also been suspended from the ceiling to create more space. Finally, note all those white storage cupboards. They are handle-less, streamlined and completely uniform. 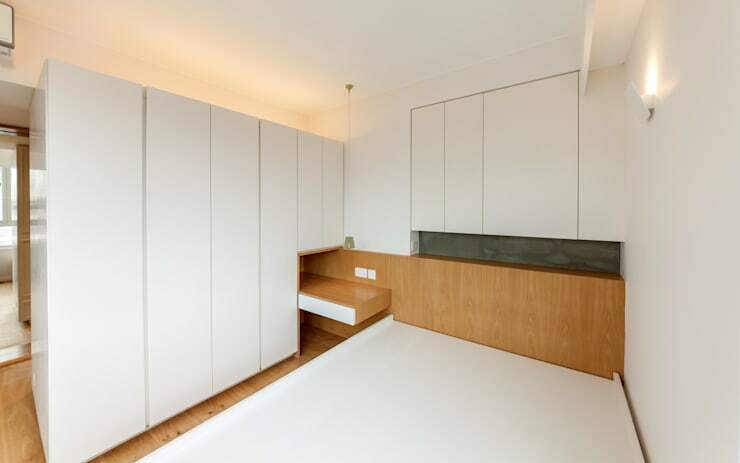 White cupboards like this are a great way to maximise space and totally eliminate the potential for clutter in the bedroom. The built-in storage units in the children's bedroom are sure to be a favourite with young ones. The fun facade and quirky shapes add real interest to the room. Open storage containers are of great benefit in kid's rooms and nurseries. Children find them easy to use and there's no danger of little fingers getting hurt in the process. See how the storage containers can be stacked here, in the area that resembled a little door for the house. Also, note the black feature wall. A simple black wall is a great way to add interest and variety to a monochrome home. Perhaps this even doubles as a blackboard as well! The bath and shower area has been completely walled off from the rest of the bathroom. 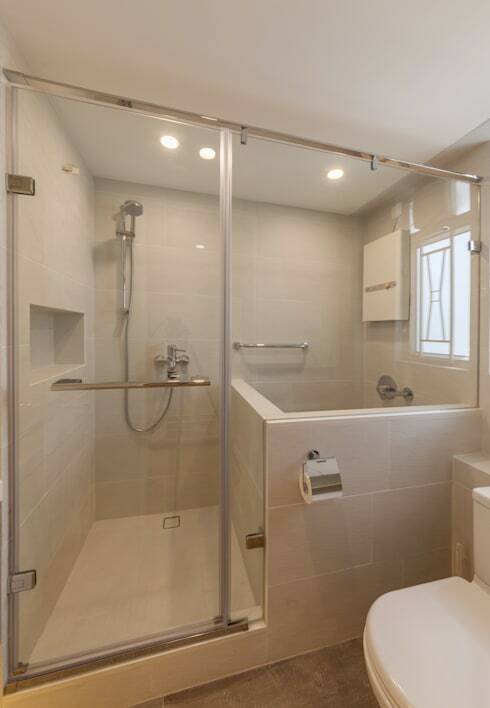 Combining the two units like this helps make the most of every square inch of space and makes the bathroom feel large and expansive. A simple, all-white decor adds the final touch. If this property has got you thinking about how to be smart about the space in your home, you'll love The tiny apartment of big ideas. 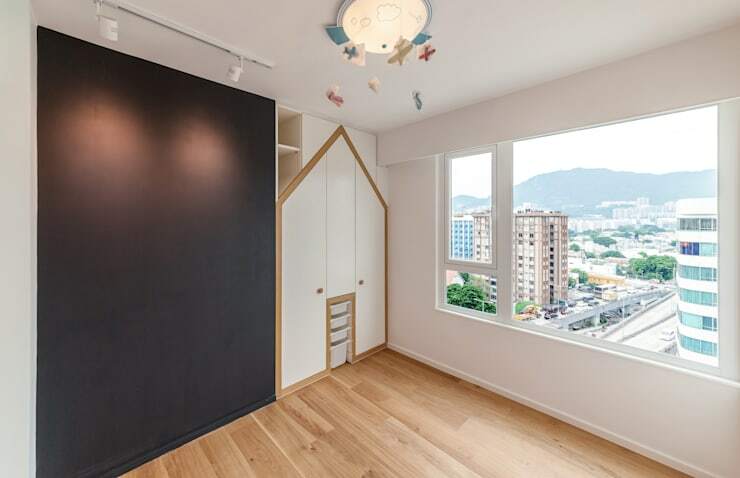 What do you think of the abundant storage solutions in this Hong Kong family home? Has it inspired you to improve your home decor?